Widgets probably changed. I'll be updating it tomorrow as I'm done for today. Tried several times crafting several different types of armor. Withdraws everything properly but does not craft the actual items after it clicks "Needle > Item"
Also, is there any way to get Coifs on the script? Thanks in advance. When crafting leather, it looks like it does not take the thread from the bank. When it tires to craft leather gloves it deposits the thread into the bank, and only takes out a needle and leather. Then closes bank and uses needle with leather, then gets the message you need some thread. Why does it deposit the thread if i need thread to craft the gloves?? ..
air battlestaves do not work. it withdraws 28 battlestaves and no air orbs..
- Script will now use sand and gold bars on furnace when making jewellery / molten glass. 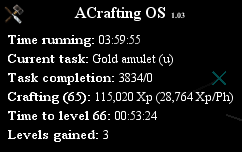 Currently making Gold Bars -> Gold Amulet (u) and the walking to and from the furnace is fine. Removing the gold bars from the bank is fine. Once I reach the furnace, the gold bar is clicked, and then it doesn't continue from there on. It doesn't click on the furnace to select making the Gold Amulet (u). It just sits in the room, and doesn't begin making the amulet. 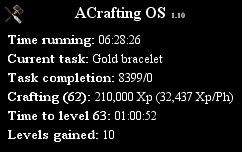 I think the problem is that it doesn't click from the bar, to the furnace, or that it is using the gold bar with the people standing at the furnace smelting, and "nothing interesting happens"
- Added all crafting interfaces support. - Added better object handling. Keep in mind that the OSRS client is still in development so not everything works as it should.